How sad is it that I spent the entire day lounging around? I didn’t go to the store, go for a trail run, or even haul myself to the closest Academy Sports to see the National Championship trophy to get a pic. My friend Kaye saved me by posting on fb that they were waiting until it lands at the Alabama museum and no crowds. Good thinking, Kaye. I turned over and finished reading #5 in the J.D. Robb (Nora Roberts under new pen name) series. Her latest book and 34th in the series will be out in February. Before each new release, I re-read the whole series. It’s just that good. I held off on the series for years due to the futuristic details she includes. I was sure she had sci-fi creatures and other stuff I couldn’t relate to. But, although the books are set in 2058, the only details are technology with faster computers, holograms, Auto-chefs (souped up microwaves that actually create meals, not just cook/warm up) medical advancement, and more accessible space travel. The people are all real. And at the end of the day, the good cop wins over evil and I’m all about that. What I DID do this weekend is get my races and training plans in order. I’m still tweaking some details and travel details around our work schedules, but I’m getting a big clear picture ready for 2012, not counting smaller 5 and 10ks. 2011 was huge for me getting my first marathon. I want to do it better in 2012. Along the lines of training plans and races, good food is a must. 2. 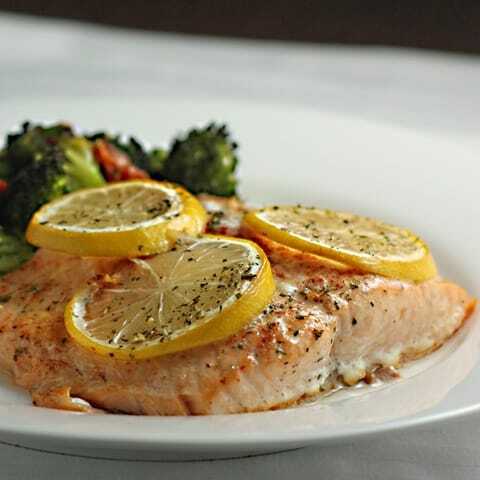 Prepare salmon by drying with paper towel, if needed, and adding seasonings. I used chipotle, dill, salt and ground pepper. Top with sliced lemon. 3. Place in baking dish that has been sprayed with oil. Bake 10-15 minutes until internal temp reaches 155-160*. This really does look simple and healthy! I bet it’s pretty delicious too. what kind of chipotle did you use? a rub? This looks really good, what kind of chipotle seasoning did you use?